Friday 31st March 2017 – 4pm – Jamie Arrowsmith. A male teenage motorcyclist has suffered a serious head injury following a collision with a van this afternoon. West Midlands Ambulance Service was called to Croxstalls Road in Bloxwich, shortly after 12.30pm and sent an ambulance, a paramedic area support officer and the Midlands Air Ambulance from Cosford to the scene. A West Midlands Ambulance Service spokesman said: “On arrival, ambulance crews discovered the motorbike rider lying in the road. “He was treated for a serious head injury which had resulted in him suffering a reduced level of consciousness. “He also received treatment for a knee injury as well as numerous cuts across his body. “Pain relief was administered and he was immobilised before being taken to hospital by land ambulance. The air ambulance crew also travelled to continue treatment en-route. Friday 31st March 2017 – 2pm – Murray MacGregor. An MP is throwing his support behind a lifesaving campaign by learning the skills that could make the difference between life and death. On Friday, Hereford and South Herefordshire MP, Jesse Norman learnt the vital skills of cardiopulmonary resuscitation (CPR) and just how simple it is to use an automated external defibrillator (AED) when he visited Hereford Ambulance Hub. It follows a generous donation from the Four Acre Trust which donated £50,000 towards buying additional AEDs for rural areas of Herefordshire and Worcestershire. To qualify, local communities need to raise half the money and the Four Acre Trust will pay the other half. Together, it should ensure an additional 100 lifesaving defibrillators placed in communities across the two counties. Since the scheme was launched in the middle of January, 58 new defibrillators have been installed across Herefordshire and Worcestershire. Many have been bought by parish councils, but others have gone to rugby clubs, a golf club, community centres, village halls, three pubs, two churches, three schools and even Hereford Livestock Market. Mr Norman said: “As a local MP I am already very aware of the vital services that our ambulance service provides. But my training session with Herefordshire Area Manager Nick Montandon really drove home to me what an important role we can all play in saving a life. “When someone has a cardiac arrest, the heart stops beating and it is vital that the patient gets help immediately. For every minute after the heart stops, the patient’s chance of survival drops by 10%. If someone starts CPR on them immediately and a defibrillator is quickly used, up to 90% of patients can be saved. WMAS Herefordshire Area Manager, Nick Montandon, said: “Whether you have had training or not, you can make a difference if you know how to perform CPR and know where your nearest defib is. By increasing their number in the community we give many more people the best possible chance of survival; more lives can be saved. Communities, groups and organisations who want to take up the offer should apply to the Hereford and Worcester Community First Responder (HWCFR) Charity who will arrange for the defib to be placed in a box on the likes of a church wall, school, shop or even pub; anywhere that it can be accessed 24 hours a day. HWCFR Charity Trustee, Sue Watkins, said: “Not only will we help the community to install the defib, we will work with West Midlands Ambulance Service to train local people in its use. However, people should remember that you do not need to have had any training to use one. Please do not substitute ‘heart attack’ for ‘cardiac arrest’ as they are quite different. A heart attack is a “circulation” problem and sudden cardiac arrest is an “electrical” problem. A heart attack is when blood flow to the heart is blocked but the heart keeps beating, if only inefficiently. A cardiac arrest is when the heart malfunctions and suddenly stops beating completely. In a cardiac arrest, brain damage starts at 6 minutes and at 10 minutes there is nothing that can be done to save a patient. A defibrillator is used to reset the heart so that it can start beating normally again. Pictured (l-r) – Hereford and Worcester Community First Responder Charity Trustee, Sue Watkins, Hereford and South Herefordshire MP Jesse Watkins and WMAS Area Manager for Herefordshire, Nick Montandon. If used, please credit the image to West Midlands Ambulance Service. Thursday 30th March 2017 – 5.00pm – Claire Brown. A pedestrian has been seriously injured after a collision with a lorry in Hereford Town Centre this afternoon. A passing ambulance came across the incident near Wall Street in Hereford shortly after 3.00pm (Thursday) and immediately called the Trust’s control room to advise them of the collision. A second ambulance, a paramedic area support officer, the Midlands Air Ambulance from Strensham and a second Air Ambulance from Cosford with a MERIT trauma doctor on board attended the scene. 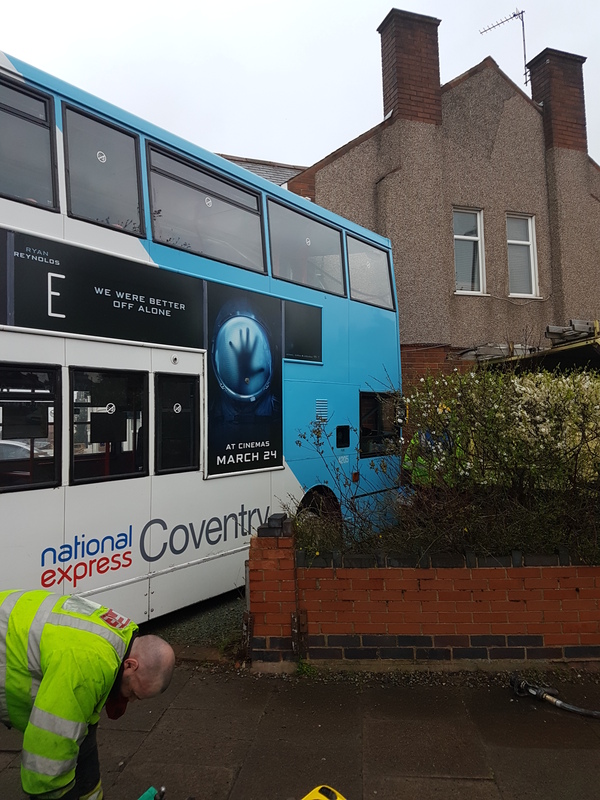 A West Midlands Ambulance Service spokeswoman said: “The pedestrian, a man in his 50s, was fully conscious following the collision but was trapped underneath the lorry. Ambulance staff assessed the man and found he had suffered serious injuries to his abdomen, back and feet. Whilst ambulance staff administered treatment to the man, the fire service worked to release him. Thursday 30th March 2017 – 12.10pm – Jamie Arrowsmith. A woman and a teenage boy have died and a man has been seriously injured after all three received stab wounds this morning. West Midlands Ambulance Service was called to Greyhound Lane in Norton, Stourbridge, at 8.01am today (Thursday). The Midlands Air Ambulances from Cosford and Staffordshire were sent to the scene along with two land ambulances, two MERIT trauma doctors, two senior paramedic officers, a paramedic area support officer and a community paramedic in a rapid response vehicle. A West Midlands Ambulance Service spokesman said: “Ambulance staff arrived on scene to find three seriously injured patients; a woman, a man and a boy. “Unfortunately, despite the best efforts of ambulance staff it became apparent at the scene that nothing could be done to save the woman and she was confirmed deceased. “The teenage boy was found to be in cardiac arrest and received specialist trauma care and advanced life support from our staff. He was taken on blue lights to Birmingham Children’s Hospital with treatment continuing en-route. “Sadly, shortly after arrival in A&E and despite the best efforts of ambulance staff and hospital medics, nothing could not be saved and he was also confirmed dead. Thursday 30th March 2017 – 10.45am – Jamie Arrowsmith. 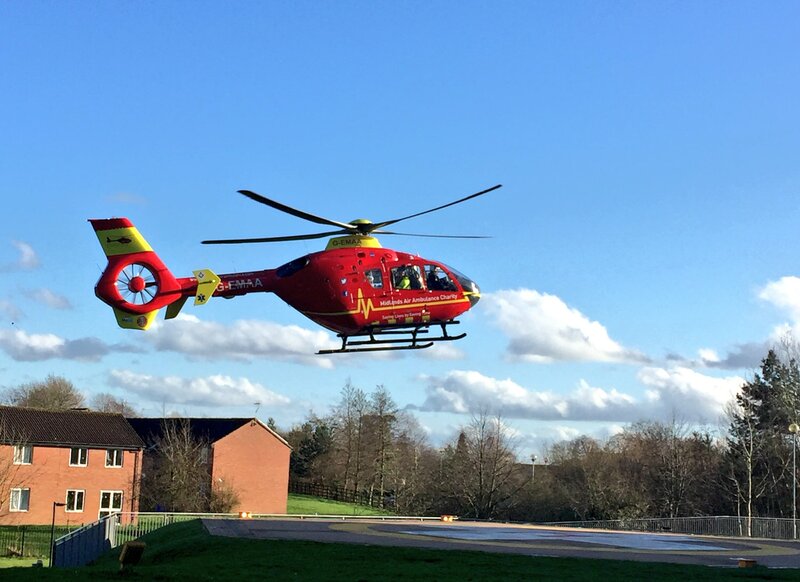 Three people have been seriously injured after an incident in Stourbridge. West Midlands Ambulance Service was called to Greyhound Lane in Norton at 8.01am today (Thursday). The Midlands Air Ambulances from Cosford and Staffordshire were sent to the scene along with two land ambulances, two senior paramedic officers, a paramedic area support officer and a community paramedic in a rapid response vehicle. A West Midlands Ambulance Service spokesman said: “Three patients suffered serious stab wounds in the incident. Wednesday 29th March 2017 – 1.45pm – Claire Brown. A woman has died following a flat fire this morning in the Black Country. The ambulance service received a 999 call shortly before 9.30am to New Pool Road in Cradley Heath. An ambulance, a paramedic area support officer and a community paramedic attended the scene along with the fire service and police. Wednesday 29th March 2017 – 12.30pm – Claire Brown. A woman has sadly died after the car she was in collided with a tree this morning. 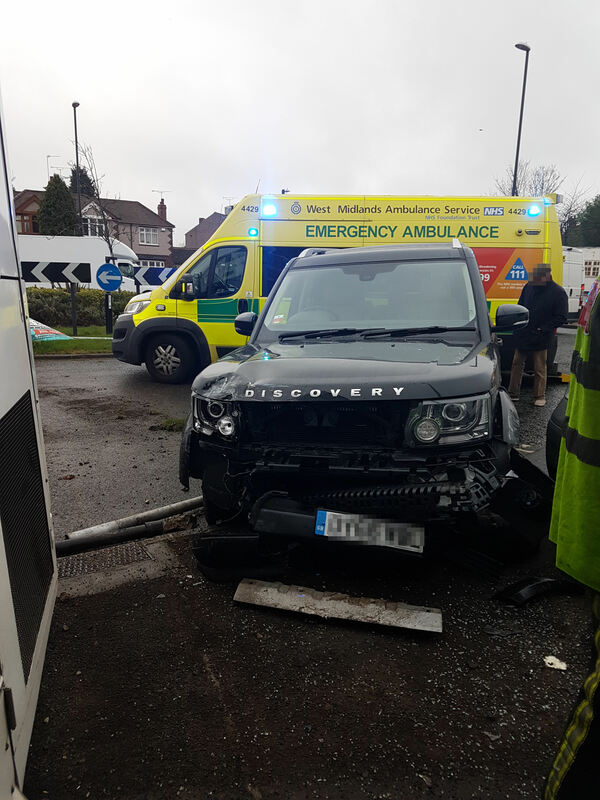 West Midlands Ambulance Service was called to Hill Lane in Wythall, Birmingham, at 9.20am today after a passer-by came across the collision and stopped to help. Two ambulances, a BASICS doctor, a paramedic area support officer and the Midlands Air Ambulance from Cosford with a MERIT trauma doctor on board attended the scene. Monday 27th March 2017 – 6.30pm – Claire Brown. A man has died on the M42 in Coventry this afternoon. West Midlands Ambulance Service was called to reports of a car which had left the carriageway shortly after 2.30pm on the southbound carriageway of the M42 between Junctions 8 and 7a. Two ambulances, a paramedic area support officer and the Warwickshire and Northamptonshire Air Ambulance with a medic on board attended the scene. Thursday 23rd March 2017 – 12.05pm – Murray MacGregor. 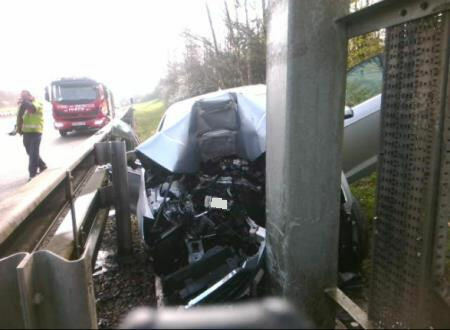 The incident happened on the M6 Toll just before junction T1 at Coleshill at about 9.05am this morning (Thursday). 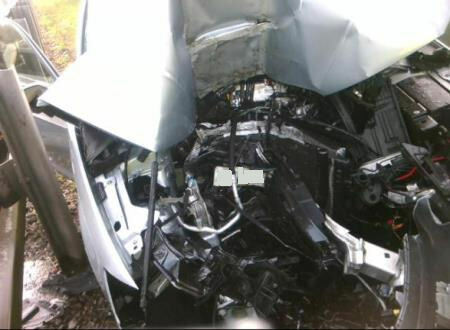 A West Midlands Ambulance Service spokesman said: “On arrival, ambulance staff found a silver car that had very significant front end damage. 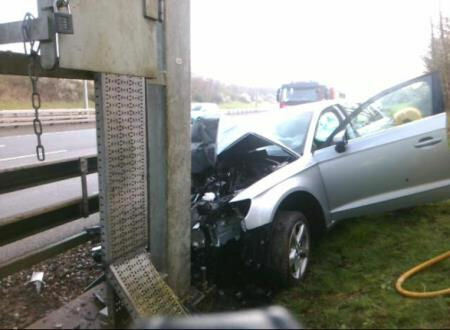 The car had left the motorway to the nearside, gone down the grass verge and collided with the gantry leaving an almost perfect square indent into the bonnet. “Despite significant intrusion within the passenger compartment, the woman was able to get out and was sitting in a car that had stopped at the scene. “Astonishingly, the 39 year old was only complaining of seatbelt pain and had a number of small lacerations but essentially escaped with minor injuries. She was taken to University Hospital Coventry & Warwickshire as a precaution. Thursday 23rd March 2017 – 10.51am – Murray MacGregor. 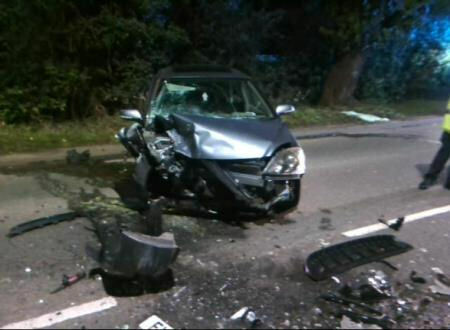 Two men have suffered critical injuries after a serious crash on Cannock Chase. 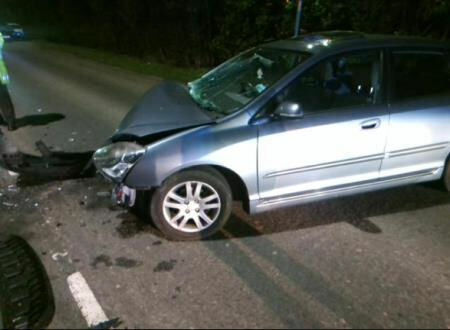 The three car crash happened at junction of Birches Valley and Marquis Drive at about 5.20pm on Wednesday afternoon. Two ambulances, a paramedic area support officer and the Midlands Air Ambulance from Cosford, with two doctors and a critical care paramedic on board, were sent to the scene. 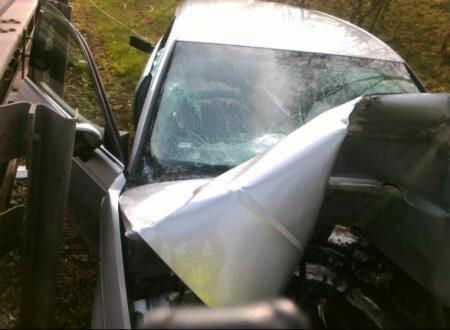 A West Midlands Ambulance Service spokesman said: “On arrival, ambulance staff found two cars that had suffered very considerable damage – one had left the road and was on the verge. “A man of approximately 30 years was airlifted to the major trauma centre at Royal Stoke University Hospital with multiple injuries. 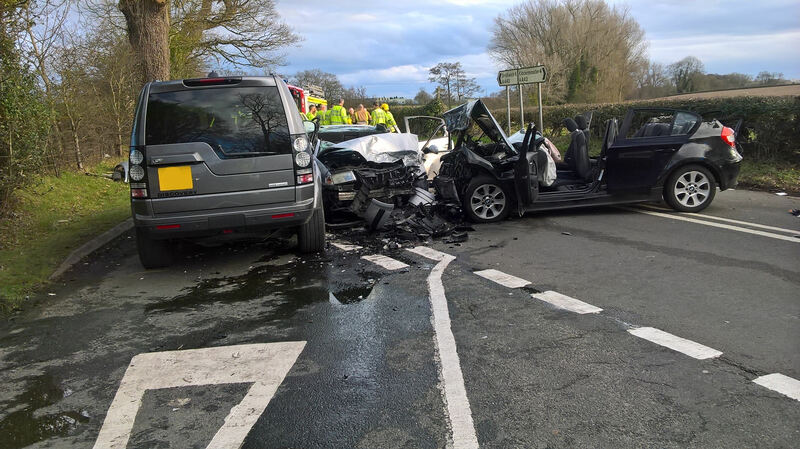 “A 52 year old man in the second car also suffered multiple injuries and was taken by land ambulance to the same major trauma centre with the second doctor travelling with the crew. Wednesday 22nd March 2017 – 12.30pm – Claire Brown. A woman has died after a collision with a car in Birmingham this morning. The incident happened near to the Co-op supermarket on New Road in Rubery shortly after 10.30am (Wednesday). An ambulance, a paramedic area support officer and a BASICS medic attended the scene. A West Midlands Ambulance Service spokeswoman said: “When ambulance staff arrived they found a pedestrian, a woman, who had been involved in a collision with a car. Sadly, it quickly became apparent that nothing could be done to save her and she was confirmed dead on scene. Wednesday 22nd March 2017 – 9.20am – Claire Brown. Despite the life-saving efforts of our staff on scene, a motorcyclist sadly couldn’t be revived in Kidderminster this morning. 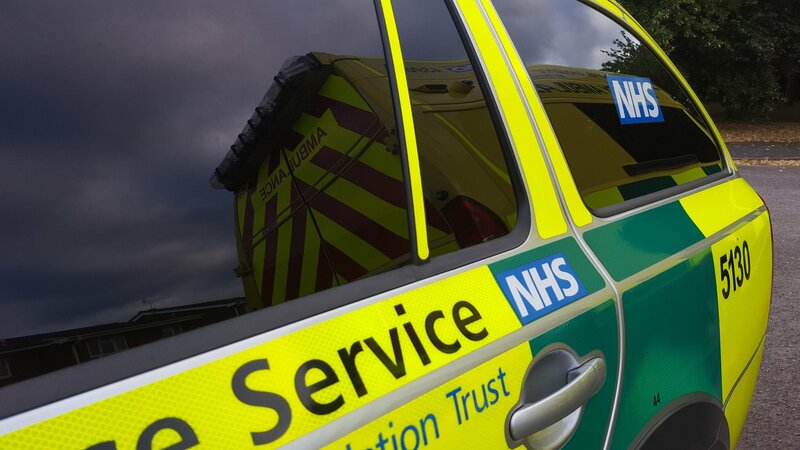 West Midlands Ambulance Service received a 999 call reporting a collision involving a motorcyclist and a lorry on the Hartlebury Trading Estate in Hartlebury, Kidderminster shortly after 5.30am today (Wednesday). An ambulance, a paramedic area support officer and a MERIT trauma doctor attended the scene. Honestly, he was so so lucky! Wednesday 22nd March 2017 – 8.40am – Murray MacGregor. The words of one of the paramedics who was left amazed after seeing the teenage driver of a van get out of a crash with relatively minor injuries despite huge damage to the front of the vehicle he was in. The crash happened at about 9.45pm on Tuesday evening on the southbound M6 just before junction 10a, the M54. Two ambulances, a paramedic area support officer and the MERIT Trauma Doctor attended the scene. 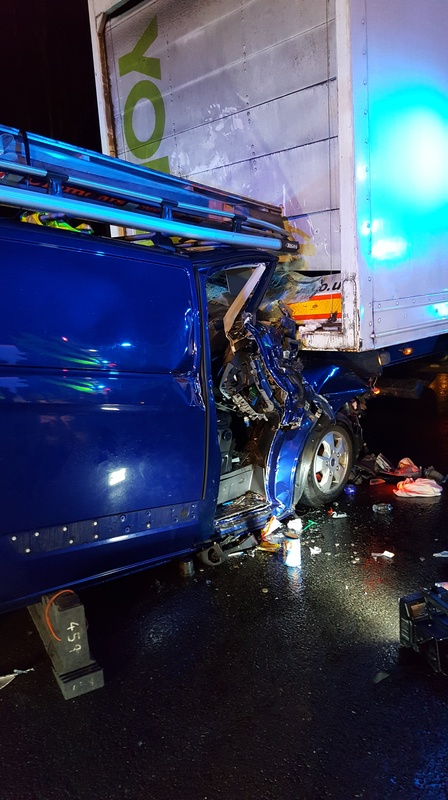 A West Midlands Ambulance Service spokesman said: “On arrival, ambulance staff found a blue van that was embedded under the rear of an articulated lorry. 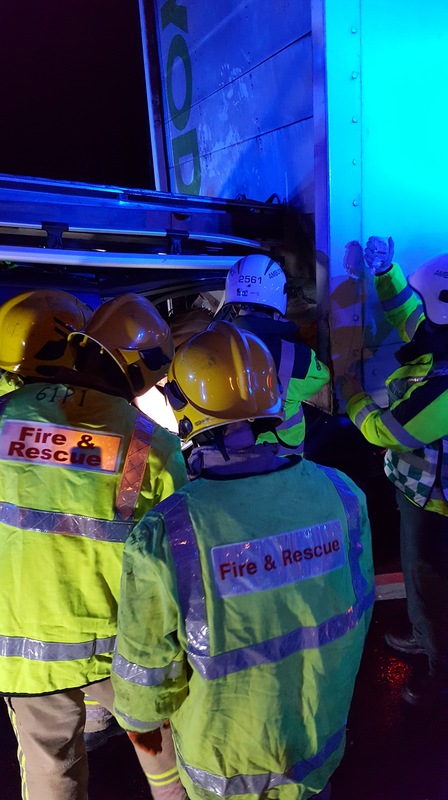 “Due to the level of damage, it took firefighters an hour to cut away enough of the van to allow the two people inside the van to get out; throughout, the pair were receiving care from ambulance staff. 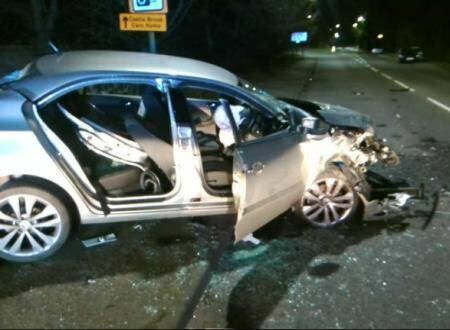 “The 18 year old driving, who comes from Warwickshire, escaped with only a broken left wrist. After being assessed by the doctor at the scene, he was taken to Walsall Manor Hospital. “The man’s 8 year sister, who was in the front passenger seat, escaped uninjured. After being assessed, she was discharged at the scene. Tuesday 21st March 2017 – 5.00pm – Claire Brown. A pedestrian and a motorcyclist have died following a collision in Shropshire this afternoon. West Midlands Ambulance Service received a call from North West Ambulance Service reporting a collision involving a pedestrian and a motorcyclist on the A525 Nantwich Road between Broughall and Whitchurch shortly before 3.30pm (Tuesday). A community paramedic, a paramedic area support officer and the Midlands Air Ambulances from Strensham and Cosford were sent to the scene; one air ambulance had a MERIT trauma doctor on board. A West Midlands Ambulance Service spokeswoman said: “When ambulance staff arrived they found a pedestrian and a motorcyclist who were both in cardiac arrest. Sadly, it quickly became apparent to ambulance staff that nothing could be done to save the pedestrian, a man, and he was confirmed dead on scene. “Ambulance staff and the doctor administered advanced life support to the motorcyclist but despite their efforts he was unable to be saved. Monday 20th March 2017 – 12.00pm – Murray MacGregor. 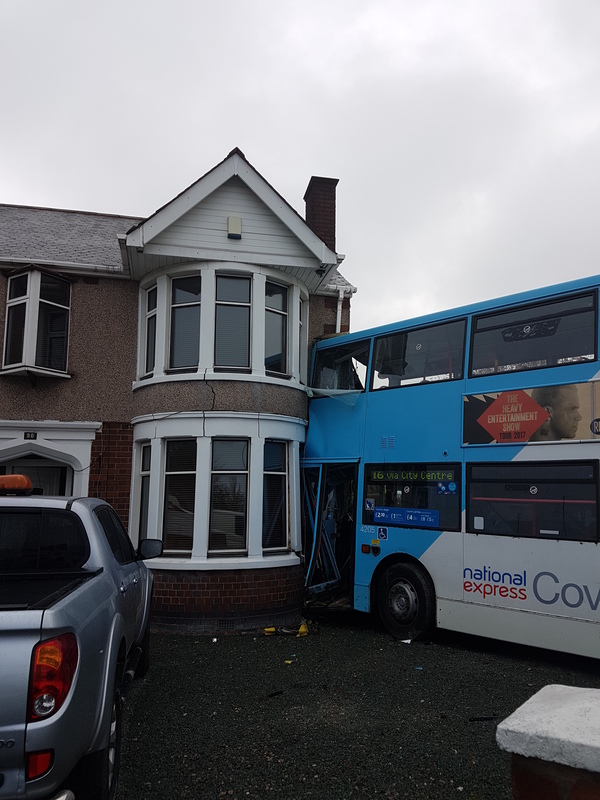 Four people have avoided serious injury despite a collision between a double decker bus, a 4×4 and a house. 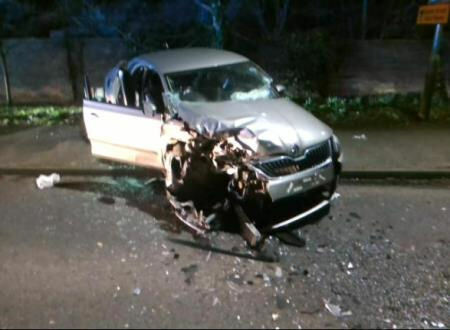 The incident happened at about 6.45am this morning in Keresley Road, Coventry. 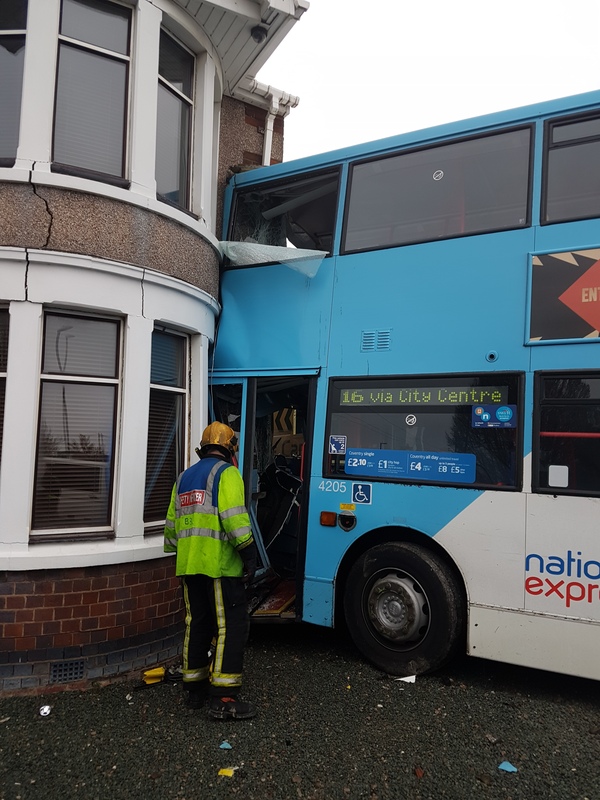 A West Midlands Ambulance Service spokesman said: “On arrival, ambulance staff found a double decker bus that was up against a house; the house had sustained structural damage. A Land Rover Discovery was near-by with front end damage. “There were three people on the bus. The driver, a 44 year old man had sustained a graze to his right knee but was otherwise unhurt. 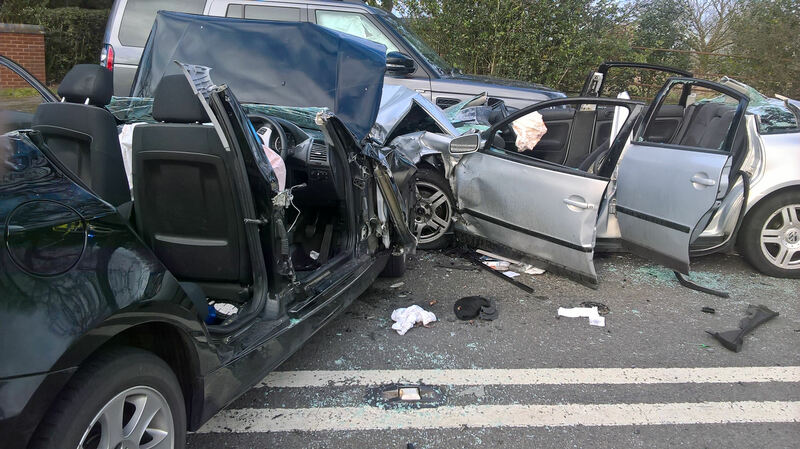 A 27 year old man who had been on the rear seat had a minor laceration to his lower right leg and a man estimated to be in his 50s had a minor graze. All three were discharged after treatment at the scene. 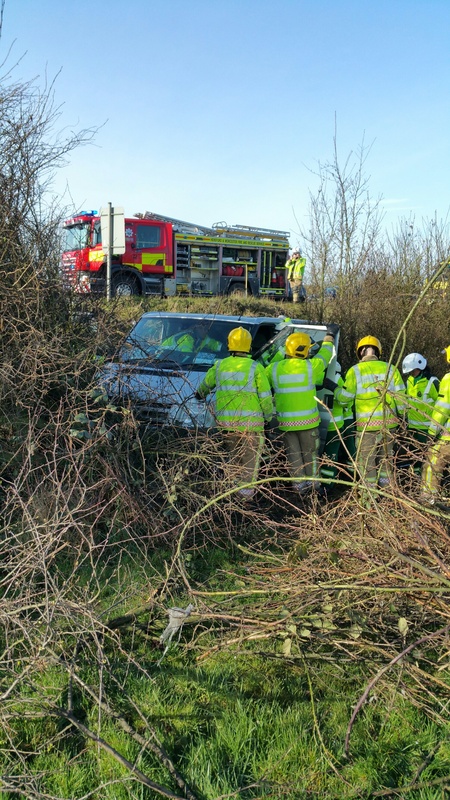 “The driver of the Discovery, a 54 year old man had managed to get out of the vehicle himself and was treated for shock, but again was discharged. Friday 17th March 2017 – 9.10am – Jamie Arrowsmith. A woman has died following a collision with a car last night (Thursday). The incident happened on Ashbourne Road in Leek shortly before 6.40pm and West Midlands Ambulance Service sent an ambulance and a paramedic area support officer to the scene. A West Midlands Ambulance Service spokesman said: “An ambulance crew was on scene in less than four minutes and found the woman lying in the road following the collision. “Having suffered serious injuries, the woman was found to be in cardiac arrest. Ambulance staff immediately began administering CPR and advanced life support. Thursday 16th March 2017 – 10.30am – Claire Brown. A darts league has hit the bullseye with local ambulance staff in Lichfield after a generous donation in memory of a former player. Lichfield and District Ladies Darts League visited Lichfield Ambulance Hub this week to present £460 to thank their local ambulance staff. The donation comes after the league said goodbye to darts player Mandy Perks who sadly passed away in August last year. Despite the tragic outcome, her husband was so grateful to the ambulance service’s help that he and the darts team she played for wanted to do something in return in Mandy’s memory. Marion Toon, chair of the darts league, visited the ambulance hub with Treasurer Alison Fisher and Secretary Jenny Sawyer to officially present the donation to Lichfield hub’s Assistant Area Manager Michelle Kelly on Tuesday 14th March. Wednesday 15th March 2017 – 9.30am – Murray MacGregor. Two men have been injured, one seriously after a crash that left two cars with substantial damage. It happened at the junction of Leamington Road and Bullimore Grove in Kenilworth at about 6.25pm on Tuesday evening. A West Midlands Ambulance Service spokesman said: “On arrival, ambulance staff found the driver of one of the cars trapped. Working with firefighters, the man was cut free. “The 55 year old had a head injury and a number of fractures. 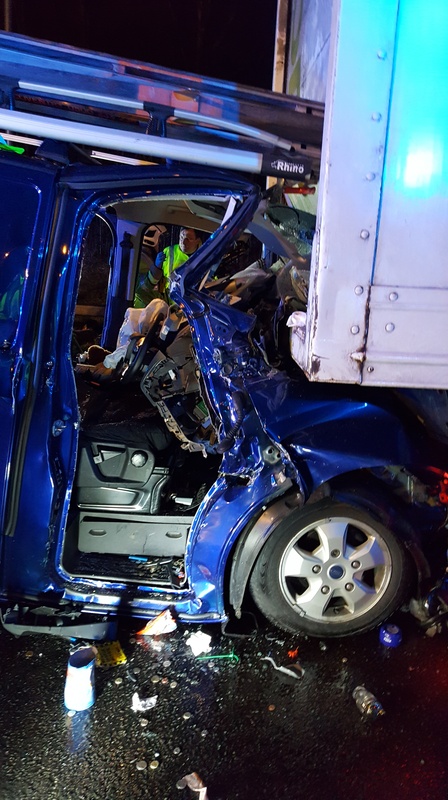 He was immobilised, had a pelvic binder fitted and had his other fractures splinted before being taken on blue lights to the major trauma centre at University Hospital Coventry & Warwickshire. Tuesday 14th March 2017 – 4.30pm – Claire Brown. A woman has escaped with just minor injuries despite her car ending up sideways on a concrete barrier following a collision with a lorry. The collision happened on Ringway Whitefriars near to Coventry University shortly before 3.00pm this afternoon (Tuesday). An ambulance and a senior paramedic officer attended the scene. Monday 13th March 2017 – 10.40am – Murray MacGregor. 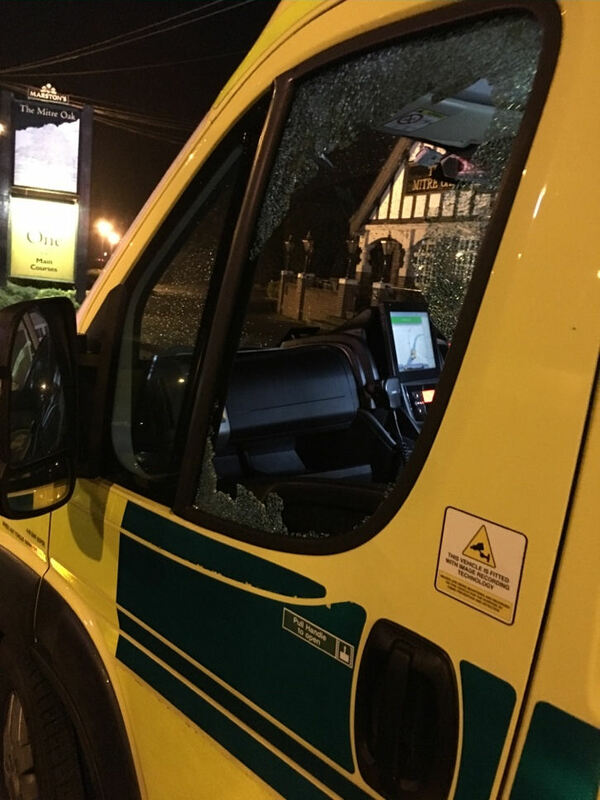 An elderly cardiac patient being taken to hospital had his treatment delayed and a crew was left shocked after a man threw a stone at an ambulance travelling on a dual carriageway, shattering the window. The incident happened at just after midnight on Sunday morning on the southbound carriageway of the A449 near the Mitre Oak pub. A second ambulance had to be sent to take the patient to hospital. A paramedic area support officer and West Mercia Police attended the scene to try and find the attacker. Emergency Medical Technician, Steve Hopkins, was driving the vehicle at the time: “We were taking an elderly patient with suspected cardiac related chest pains into Worcestershire Royal Hospital when we were coming down the A449. “I remember seeing three lads, who were probably late teens, dressed in black who were walking towards Kidderminster. At the last minute I caught sight of the one in the middle throwing something and the next second the passenger window in the cab exploded covering me in glass. “It was a real shock but thankfully I wasn’t hurt. To be honest, I was more concerned about our patient. It’s a stressful enough situation without something like this happening. WMAS Security and Safety Manager, Steve Elliker, added: “Although police did attend and searched the area, there was no trace of the three youths. Anyone with information should call 101 and quote incident 2S of 12th March. Alternatively, you can call Crimestoppers on 0800 555 111. Friday 10th March 2017 – 10.15am – Jamie Arrowsmith. A motorcyclist has died following a collision with a barrier in the early hours of this morning. West Midlands Ambulance Service was called to the junction of Dartmouth Middleway and Aston Circus at 4.15am and sent an ambulance, a paramedic area support officer, a MERIT trauma doctor and the Trust’s Hazardous Area Response Team to the scene. A West Midlands Ambulance Service spokesman said: “Crews arrived to find a motorcyclist, a man, in cardiac arrest following a single vehicle collision. “CPR was commenced immediately and advanced life support was also administered. Thursday 9th March 2017 – 7.45am – Murray MacGregor. Five people have been hurt after a three car crash. It happened at the junction of the A442 and Curslow Lane to the south of Kidderminster at around 2.45pm on Wednesday afternoon. A rapid response vehicle came across the incident shortly after it had happened. A further four ambulances, two paramedic officers and the Warwickshire and Northamptonshire Air Ambulance were sent to the scene. A West Midlands Ambulance Service spokesman said: “Two of the cars had suffered significant damage, while the third was relatively undamaged. “Three people were initially trapped in the wreckage of the badly damaged cars; two in one car and one in the other. “Ambulance staff treated the patients while firefighters set about cutting them free. 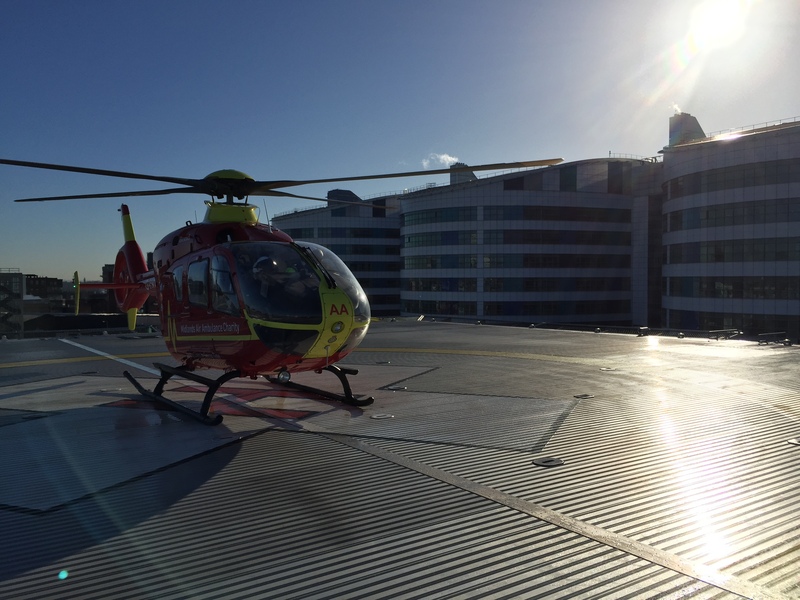 “The most seriously injured person was a man in his 30s who was airlifted to the major trauma centre at Queen Elizabeth Hospital Birmingham with a head injury, wrist fracture, a leg injury and a possible fracture to his pelvis. He was immobilised and had a pelvic binder put in place. “The other four patients injured were all men; they were less serious and all went to Worcestershire Royal Hospital. Wednesday 8th March 2017 – 11.55am – Murray MacGregor. Two people have died and two others have been injured after an incident in Wolverhampton. West Midlands Ambulance Service was called to Leasowes Drive in the Penn area at 9.46am today (Wednesday). 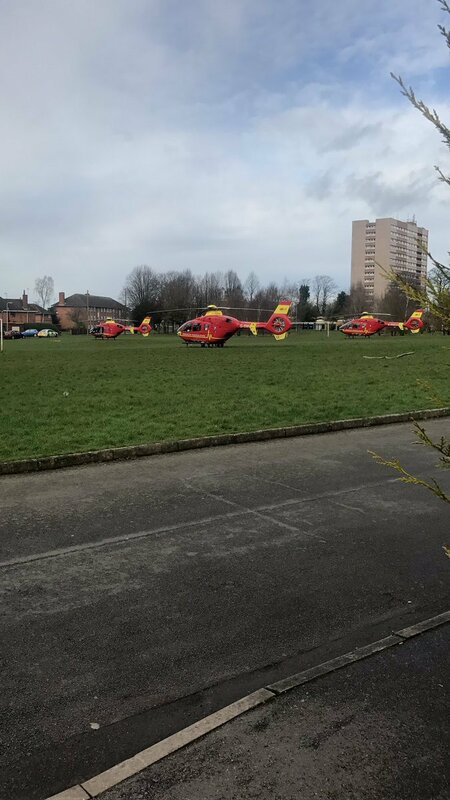 The Midlands Air Ambulances from Cosford, Strensham and Staffordshire were all sent to the scene along with three land ambulances, three paramedic officers and the West Midlands Care Team Doctor. A West Midlands Ambulance Service spokesman said: “A man and woman estimated to be in their 30s had suffered very serious stab wounds. Sadly, despite best efforts by ambulance staff, it was not possible to save either of them and they were confirmed dead at scene. “Another woman in her 50s was taken on blue lights to the major trauma centre at the Queen Elizabeth Hospital Birmingham with potentially life threatening stab wounds to her stomach. Aircrew paramedics traveeled with the patient to provide additional treatment en route. Wednesday 8th March 2017 – 10.25am – Murray MacGregor. Three patients have suffered serious injuries after an assault. West Midlands Ambulance Service was called to Sefton Drive in Bomere Heath to the north of Shrewsbury at just after 8.10am this morning. An ambulance, a paramedic area support officer and the Midlands Air Ambulances from Cosford and Staffordshire were sent to the scene. A West Midlands Ambulance Service spokesman said: “A middle aged woman who was outside the property had suffered a stab wound to the chest. After assessment and treatment at the scene, she was airlifted to a major trauma centre. “A middle aged man inside the property had suffered multiple stab injuries. His condition was also stabilised before being airlifted to a major trauma centre. Wednesday 8th March 2017 – 9.10am – Murray MacGregor. A motorcyclist has been airlifted to a major trauma centre with multiple injuries after a crash on a country road. The incident happened at about 4.20pm on Tuesday afternoon on the road between Moseley and Wichenford in Worcestershire. 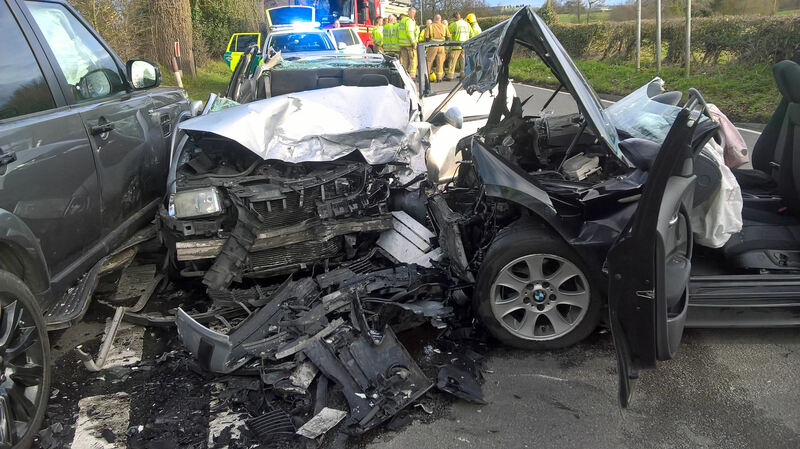 Initial reports suggested the patient was in an extremely serious condition after colliding with a telegraph pole so a rapid response vehicle, an ambulance, a paramedic area support officer and the Midlands Air Ambulance from Strensham were sent. A West Midlands Ambulance Service spokesman said: “On arrival, the patient was assessed and found to be in a critical condition. The ambulance staff immediately requested a doctor and the Midlands Air Ambulance from Cosford was also dispatched with a trauma doctor on board. Monday 6th March 2017 – 4.30pm – Murray MacGregor. Five people have been assessed by ambulance staff after a flat fire. The incident in Redway Court, Mount View, Sutton Coldfield happened at just after 1.30pm on Monday afternoon. An ambulance, a paramedic area support officer and the Hazardous Area Response Team were sent to the scene. 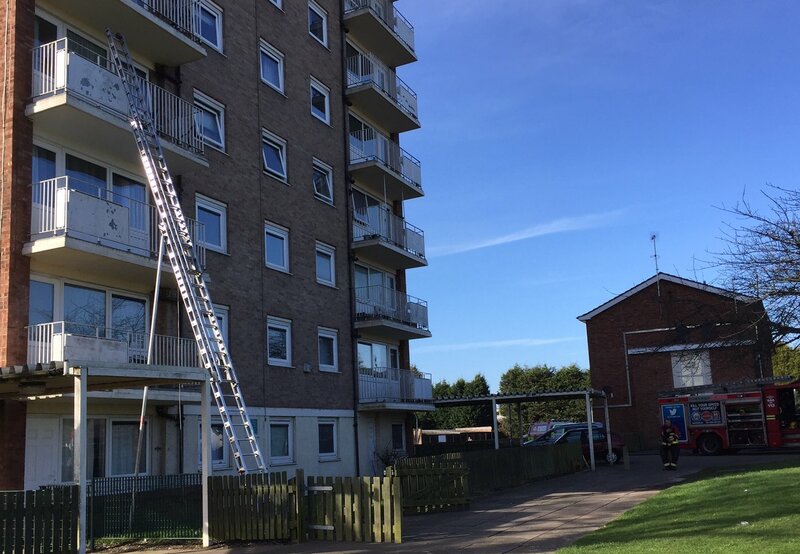 A West Midlands Ambulance Service spokesman said: “Firefighters used a ladder to rescue two adult women and two young children from a third floor flat. “Thankfully, none of those rescued were suffering from the effects of smoke inhalation and they were all discharged at the scene. “Ambulance staff carried out assessments on a 29 year old woman, a 17 month old boy and a 3 month old girl. A second adult woman declined an assessment. Monday 6th March 2017 – 12.40pm – Murray MacGregor. A young boy has been airlifted to the region’s paediatric major trauma centre after he was involved in a collision with a car. The incident happened at about 8.45am on Shobnall Street in Burton On Trent between Shobnall Close and Casey Lane. An ambulance, a paramedic area support officer and the Midlands Air Ambulance from Staffordshire were initially sent. A West Midlands Ambulance Service spokesman said: “The first update from the scene said the child was unconscious so the Midlands Air Ambulance from Cosford with a trauma doctor on board was also sent. “The five year old had a suspected head injury. 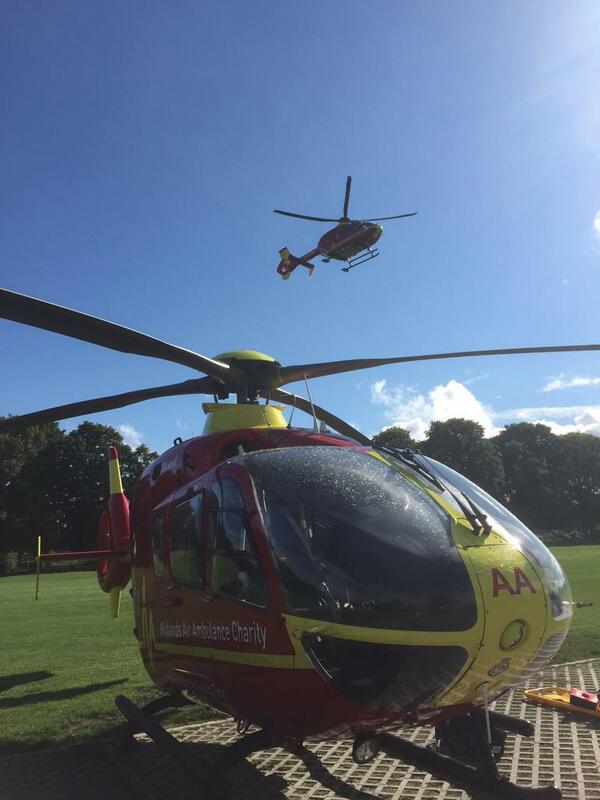 “After assessment at the scene, the youngster was taken by land ambulance to the Staffordshire aircraft which had landed on playing fields nearby, for the flight to Birmingham Children’s Hospital. Monday 6th March 2017 – 11.48am – Murray MacGregor. 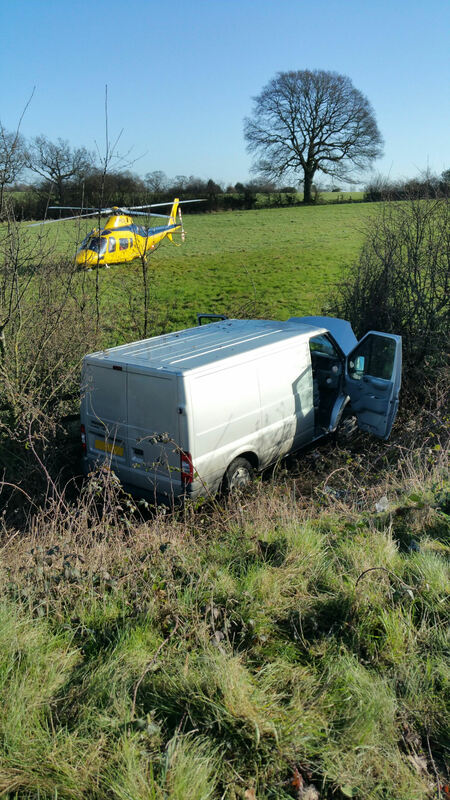 A van driver has been airlifted after his van left a busy motorway and went down an embankment into a bush. The incident happened on the M42 just before junction 3a for the M40 on the northbound carriageway. An ambulance, a paramedic area support officer, the Warwickshire and Northamptonshire Air Ambulance and the Hazardous Area Response Team were sent to the scene after a number of 999 calls at about 8.05am this morning, Monday. A West Midlands Ambulance Service spokesman said: “On arrival, crews found a panel van that had left the motorway to the nearside, gone down a steep embankment and ended up in shrubs. “The driver, a 38 year old man, was trapped by his leg in the vehicle. Ambulance staff worked with firefighters to extricate the man. “He had suffered injuries to his head, left leg and foot, possible damage to his pelvis and had neck and back pain. Friday 3rd March 2017 – 2.40pm – Jamie Arrowsmith. A man, found lying next to a moped and a wall, has sadly been confirmed deceased by ambulance staff. West Midlands Ambulance Service was called to Main Street in Clifton Campville at 7.34am this morning and sent an ambulance, a community paramedic in a rapid response vehicle and a paramedic area support officer to the scene. A West Midlands Ambulance Service spokesman said: “On arrival at the scene, crews discovered a moped trapped between a lamppost and a wall. “The patient, a man, was lying the other side of the wall and was trapped. Friday 3rd March 2017 – 9am – Jamie Arrowsmith. A man has died and two other people required treatment from ambulance staff following a house fire last night. West Midlands Ambulance Service was called to Belmont Road in Malvern just before 9.50pm and sent two ambulances, a paramedic area support officer and a MERIT trauma doctor to the scene. A West Midlands Ambulance Service spokesman said: “A man was rescued from the house by the fire service and found to be in cardiac arrest. “CPR began immediately and ambulance staff also administered advanced life support. “However, despite everyone’s best efforts, it unfortunately became apparent that nothing could be done to save him and he was confirmed dead at the scene. Thursday 2nd March 2017 – 4pm – Jamie Arrowsmith. A man has died following a single vehicle road traffic collision this morning in which his car came to rest on its roof. West Midlands Ambulance Service was called to Woodrow Lane in Chaddesley Corbett, Worcestershire, shortly after 9.55am and sent two ambulances, a paramedic area support officer, a senior paramedic officer and the Midlands Air Ambulances from Cosford and Strensham to the scene. A West Midlands Ambulance Service spokesman said: “On arrival at the scene, crews were told that the car had initially collided with a bush before coming to rest on its roof. “Police at the scene had already got the man out of the vehicle and started CPR after finding him in cardiac arrest. Thursday 2nd March 2017 – 12.10pm – Jamie Arrowsmith. A near three-hour rescue operation was carried out yesterday after a man fell approximately 60ft down a steep embankment. West Midlands Ambulance Service was called to a disused railway line beneath the junction of Boathorse Road and Burns Close in Kidsgrove, at 4.30pm. An ambulance, a paramedic area support officer, a senior paramedic officer, a BASICS doctor and the Midlands Air Ambulance from Cosford attended the scene. A West Midlands Ambulance Service spokesman said: “On arrival, crews discovered the patient, a man believed to be in his 30s, who had fallen down an embankment. “The man was lying in a ravine and due to the boggy nature of the land, conditions proved extremely difficult in which to rescue him. 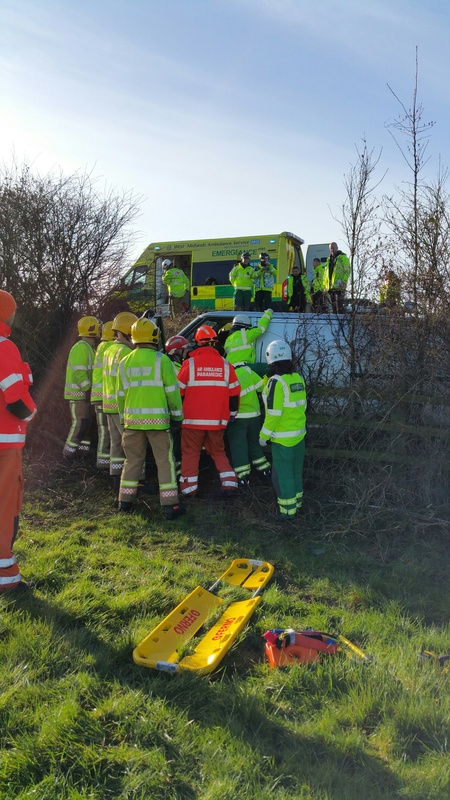 “Ambulance staff immobilised the man with the use of a scoop stretcher and moved him to more solid ground in order to allow the fire service to bring him to safety and back up the embankment. “The man, who had a slightly reduced level of consciousness initially, was treated for leg and hip injuries before being taken to Royal Stoke University Hospital by land ambulance. Wednesday 1st March 2017 – 9.15am – Jamie Arrowsmith. A pedestrian has been seriously injured following a collision with a car last night (Tuesday). It happened on Foleshill Road in Coventry at 6.45pm and West Midlands Ambulance Service sent an ambulance and a paramedic area support officer to the scene. A West Midlands Ambulance Service spokesman said: “On arrival, ambulance staff found the pedestrian, a man believed to be in his 20s, lying in the road. “Crews quickly assessed the man and began treating him for multiple serious injuries, including to his head, pelvis, shoulder blade and leg. “The man, who was suffering from a slightly reduced level of consciousness, was immobilised and given pain relief before being transported to University Hospital Coventry and Warwickshire. “The hospital had been pre-alerted to the man’s condition prior to his arrival.